Last week, for the second time in less than a year, a clear majority of Concordia students voted no. No to real estate decisions made without student input. No to speeding up the process on a long term, potentially volatile and unprecedented commercial contract. 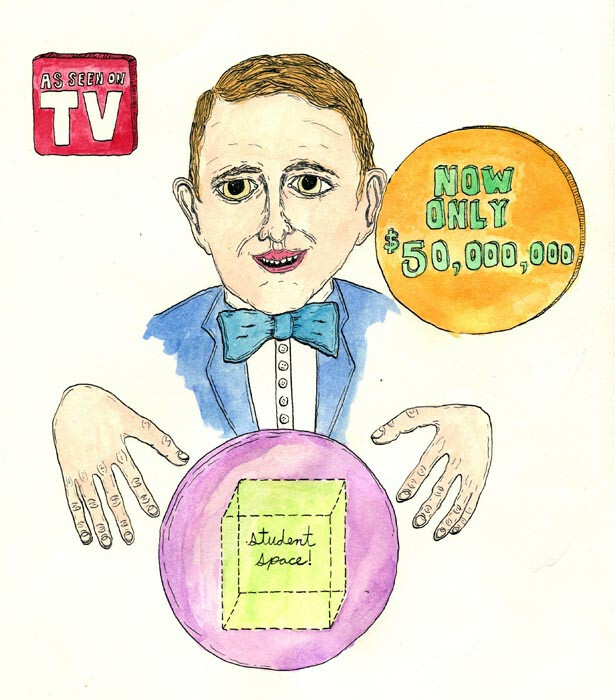 No to increasing fees to fund a $50 million stab at student space. For a moment in time, student space was the conversation on campus. It was the selling point of the Yes ad campaign that someone in an audience compared to Obama. It was then used, guerrilla-style, to mercilessly undo the Yes campaign, undermining the established political procedure in the process. People complained about how space was manipulated on both sides of the issue. Social media space was abuzz beyond the hallways and the student press. People were talking and like we said last week, it was wonderful. Promised that student space could be whatever we wanted it to be, we discussed it at length: room for clubs and associations to work and grow, choices beyond Chartwells and PepsiCo., more of our own posters in hallways that have reached retail saturation point, rooms to book without bureaucracy, leases for student groups…and the list goes on. Culminating in the dying days of crazy campaigning, the abstract ideal began to take on a surprising shape. Numbers were crunched, questions were asked and the definition of student space suddenly changed when we learned our destination was Le Faubourg. We voted accordingly—equating student space with Le Faubourg food court is as symbolic as it gets, I guess. After a referendum period unlike any other, it is a privilege to mark yet another crossroad in the storied history of student space at Concordia, when students are now asking themselves, where do we go from here? Has history been made, or is it going to repeat itself? Last week, our campus was talking about student space, agreeing that it’s reached a dire state. We asked ourselves not only who controls it, but who it should serve in a university setting. We saw, in both campaigns, that the idea of space is competely open. The Yes Campaign put up flashy posters and K’nex domes in official space. The No committees held talks, were walking billboards and dominated social media. Is a student centre, which is promised in an agreement that exists between the Concordia Student Union and the university administration, really the answer to our space case? Did you know students already had a student centre in the past? Three of them? What happened to them? Why? There are still more questions than answers, even if this referendum has been put to bed and we implore you to keep talking about the issues. Make good on another unsung campaign last week and actually ask why. Talk to the CSU and your faculty associations and brainstorm about how students should be moving forward. Think about what you want from this contract, or if you even want it period, and what you want from the student space you are already paying millions of dollars for. Or write a letter to The Link, write an opinions piece or contribute to our first ever Space special issue, slated to hit stands Jan. 25. The bottom line is we have $7 million of student money to be put towards a student centre, to create the student space we want on campus. Student space is what we make it.